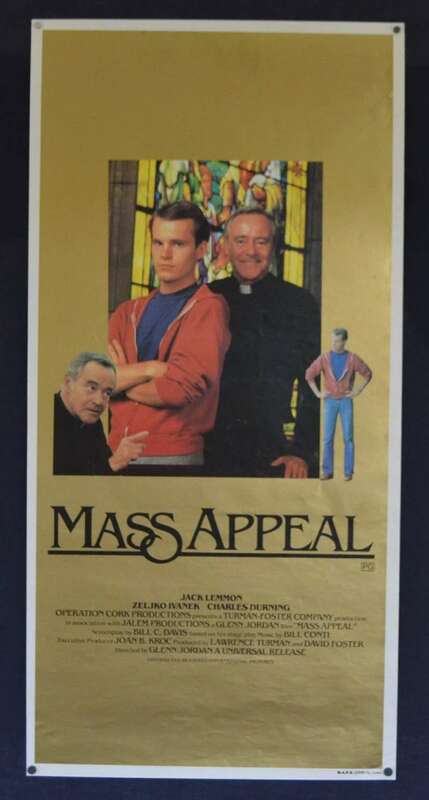 Mass Appeal is a 1984 American dramedy film directed by Glenn Jordan and starring Jack Lemmon,Željko Ivanek and Charles Durning. This was the third and final cinema movie of director Glenn Jordan. The other two theatrical feature films were The Buddy System (1984) and Only When I Laugh (1981).The screenplay by Bill C. Davis is based on his 1980 play of the same name. The storyline simply put: A popular Connecticut priest shields a seminary rebel from the wrath of a stern monsignor. Two major supporting roles for the film were added to the story which were not in the "Mass Appeal" stage play. These were the housekeeper and monsignor characters, played by Louise Latham and Charles Durning respectively. The New York Times review said “the stars work together very effectively, making the story's progress believable as each of their characters evolves into a better man. 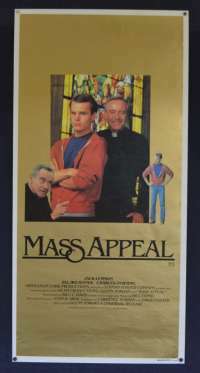 Mass Appeal doesn't have to tug too hard at the audience's heartstrings to arrive at its simple and satisfying resolution." Edge Wear / Stains: No stains. Edge Wear at top right hand vertical border. Folds and Creases: ROLLED - Never Folded. Some random scuff marks appear from general handling. Comments: This poster came from a collector who worked for the printing company MAPS. He sourced this before it was machine folded and then sent to the cinemas.Rarely does it become available like this.